also spelled Kan'eiji, Kanei-Ji or Kaneiji) is a Tendai Buddhist temple in Tokyo, Japan, founded in 1625 by Tenkai. The main object of worship is Yakushirurikō Nyorai (薬師瑠璃光如来). Because it was one of the two Tokugawa bodaiji (funeral temple; the other was Zōjō-ji) and because it was destroyed in the closing days of the war that put an end to the Tokugawa shogunate, its name is inextricably linked to that of the Tokugawa shoguns. Named after the Kan'ei era during which it was erected, this great complex used to occupy the entire heights north and east of Shinobazu Pond and the plains where Ueno Station now stands. It used to have immense wealth, power and prestige, and it consisted of over 30 buildings. Of the 15 Tokugawa shōguns, six are buried here. The Shinobazu Pond itself and the Bentendō temple which stands on its island used to be an integral part of Kan'eiji. Tenkai, liking Lake Biwa, had Benten Island built in imitation of Chikubushima, and then the Bentendō on it. At the time the island was accessible only by boat, but later a stone bridge was added on the east, making it possible to walk to it. The temple was destroyed during World War II, and the present one is just a reconstruction. The priest Tenkai wanted to create a powerful religious center and, to achieve that, he built Kan'ei-ji imitating Mount Hiei's Enryaku-ji. The temple was therefore erected north-east of Edo Castle to ward off evil spirits that were believed to come from that unlucky direction, and was named after the era it was built in, like Enryaku-ji. Tenkai's project enjoyed from the beginning the shogunate support, so much so that Tokugawa Hidetada in 1622 donated the land on which it was built. At the time, on that land there were the suburban residences of three daimyos, (Tōdō Takatora of the Tsu domain, Tsugaru Nobuhira of the Hirosaki domain and Hori Naoyori of the Murakami domain), but the land was expropriated and donated to Tenkai for the temple. He was also given 50 thousand silver Ryō and a building as a contribution. With the favor of the Tokugawa the temple prospered but, at least in the first years since foundation, it was just the Tokugawa family temple, while the sole funeral temple of the Tokugawa was still Zōjō-ji, where the second shogun Hidetada rests. His successor Iemitsu sent his remains to Nikko because the Nikkō Tōshō-gū, mausoleum of Tokugawa Ieyasu, founder of the dynasty, was there; he however also built a mausoleum at Kan'ei'ji. After that, the fourth shogun Tokugawa Ietsuna and the fifth Tokugawa Tsunayoshi were put to rest in Ueno, and Kan'ei-ji became a Tokugawa funeral temple like Zōjō-ji. Zōjō-ji didn't like the change but, after the next shogun Tokugawa Ienobu's mausoleum was built on its land, the custom became to alternate the temples at each generation, and that lasted until the closing of the shogunate era. Excepted Ieyasu and Iemitsu (buried in Nikko) and last shogun Yoshinobu (also known as Keiki, buried in nearby Yanaka Cemetery), all of the Tokugawa shoguns are buried either at Zōjō-ji or Kan'ei-ji, six at one and six at the other. In what used to be the Kan'ei-ji cemetery near the Tokyo National Museum are interred Tokugawa Ietsuna, Tokugawa Tsunayoshi, Tokugawa Yoshimune, Tokugawa Ieharu, Tokugawa Ienari, and Tokugawa Iesada). Ietsuna's and Tsunayoshi's mausoleums were destroyed in 1945. The cemetery is closed to the public, but can be seen from the street. Edo castle was handed over to Imperial troops peacefully. However, many former bakufu retainers disagreed with the decision made by former Shogun Tokugawa Yoshinobu and Katsu Kaishû. They formed a group called the Shôgitai and gathered at Kan'ei-ji temple (in what is now Ueno Park). Omura Masujiro, the commander of the Imperial troops announced that the attack against the Shôgitai would take place on May 15. As a result, almost half of the Shôgitai members deserted before that day. 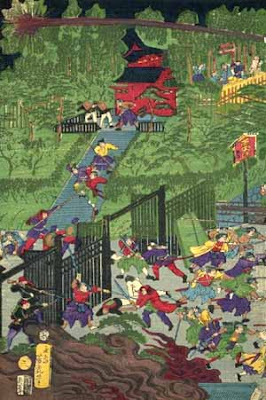 The battle started at the Kuromon ("Black Gate") of Kan'ei-ji, which was being guarded by 450 Shôgitai members. A famous statue of Saigo Takamori stands on this spot today. The Imperial troops attacked from the front of the gate and from behind the temple, attacking the temple directly with thirteen cannon based within the Edo manor of Kaga han (today the main campus of Tokyo University). The Shôgitai was destroyed in a day. The Kuromon can be found today in Entsu-ji in Arakawa-ku. ©　More in the wiki.samurai-archives.com ! cherry blossom viewing . . .
Monks used a set of these begging bowls for soup and food. Basho is also very poor like such a begging monk, but still joins the crowd around Kanei-ji in the famous cherry blossom season of Ueno. People make merry with sound and musik, food and lots of drink ... and here he sits . . .
. WKD : betting bowl 応量器 onryooki . I am always surprized how a short haiku can get us deep into the history and culture of Japan ! rain in spring and "spring rain"
High Priest of the Tendai Sect. He was close to Tokugawa Ieyasu and built the temple Kanei-Ji in Ueno. Tenkai (天海, 1536 – 1643) was a Japanese Tendai Buddhist monk of the Azuchi-Momoyama and early Edo periods. He achieved the rank of Daisōjō, the highest rank of the priesthood. His Buddhist name was first Zuifū (随風), which he changed to Tenkai in 1590. Also known as Nankōbō Tenkai (南光坊 天海?, he died in 1643, and was granted the posthumous title of Jigen Daishi (慈眼大師) in 1648. 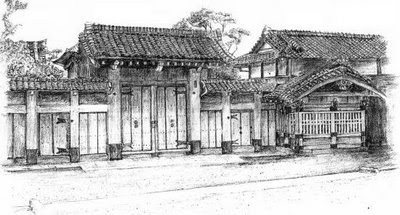 Tenkai was at Kita-in (then written 北院, 川越喜多院) in Kawagoe in 1588, and became abbot in 1599. He was on the staff of Tokugawa Ieyasu, and served as a liaison between the Tokugawa Shogunate and the Imperial Court in Kyoto. How much time did it acquire you to create “"Kanei-Ji Temple and Tenkai"”? It comes with a great deal of very good advice. Kaison is a person from the Heian period, but some say he lived more than 400 years. In a dream around the year 1588 he saw 天海僧正 Saint Tenkai eating nameshi 菜飯 rice with leaves. Tenkai told him to eat kuko meshi 枸杞飯 rice with wolfberry Lycium rhombifolium. More than 130 after that a strange old man appeared, called 残月 Zangetsu and talked about the story of Yoshitsune and Hitachibo Kaison.